GOLDEN VALLEY, Minn. (NBC) – General Mills is voluntarily recalling five-pound bags of Gold Medal Unbleached All Purpose Flour for potential salmonella contamination. 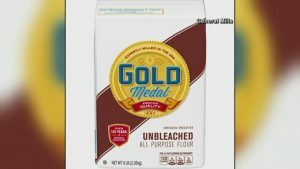 The recall is being issued for Gold Medal unbleached flour bags with a best used by date of April 20, 2020. No other Gold Medal flour products are affected by the recall. The issue was discovered during a sampling of the five-pound bag products. So far, General Mills has not received any reports of illnesses related to this product. Consumers are being urged to discard the product or return it to the place of purchase.